Two nights ago my furnace began short cycling. Short cycling is when the furnace will kick on for a few seconds, then shut off for a few seconds, then back on, then back off, repeat indefinitely. It’s loud and it doesn’t heat anything. For me, the timing couldn’t have been worse: a polar vortex slipped down that afternoon bringing with it the coldest temperatures we’ve had in decades. I ended up tinkering, but couldn’t make any progress. I moved the kiddos into the one room in the house with baseboard heating, and called a service technician in the morning. With his help and the help of Nest phone support I was able to get everything back up and running. I couldn’t find this solution online anywhere, so I’ve posted it here hoping it’ll save someone else a frigid night. Turn power off to your furnace. Remove the Nest thermostat from your wall. 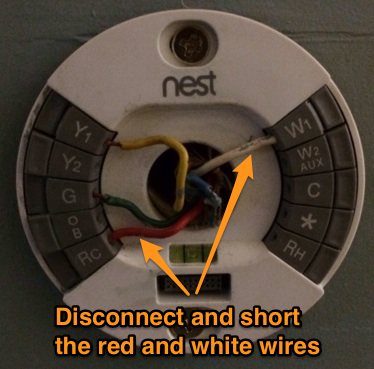 Remove the Red (Rc or Rh) and White (W1) from the thermostat. Connect the Red and White wires together (twisting, alligator clips, or whatever you’ve got to move those electrons). Turn power back on to your furnace. A thermostat is basically a programmable switch. When your heat comes on the thermostat switches power to the white wire from the red wire. That’s why this should work. If your heat comes on after shorting the red and white wires together and is no long short cycling, your thermostat is likely the problem. Remove the Nest from the wall (if you haven’t already). Replace the red and white wires to their original locations (if you haven’t already). Remove the Yellow (Y1) wire and tuck it away safely. Put the Nest back on your wall. So what’s happening? Honestly, I’m not entirely sure. 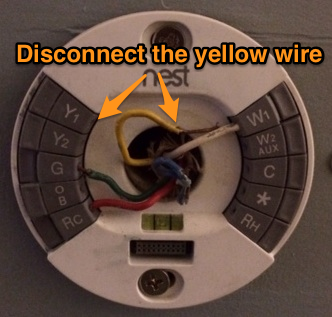 The explanation I got from Nest phone support was that the extreme cold was affecting the yellow wire that runs outside to the air conditioner somehow. Sure. I’ve seen others complain about battery problems and software updates, so take it for what it’s worth. Regardless, removing the yellow wire solved my short cycling problems. This is only a temporary solution for when it’s insanely cold. Once the polar vortex leaves and temperatures return closer to something resembling normal, I’ll reconnect the yellow wire. Otherwise the AC won’t turn on once temperatures really get up there.